If you have eaten a hearty dinner and have not run a marathon thereafter, it is very unlikely that you will feel hungry any time in the next 8 hours. However, if you find yourself munching on something or the other just before going to bed, it is not hunger that you are feeling but pangs that are triggered by appetite. The reasons for bedtime snaking can be many, not all of which can be traced to happy roots. Apple with Peanut Butter – Apples are delicious and are counted among the most nutritious foods when it comes to losing weight. It carries with it a treasure trove of nutrients while containing natural anti oxidant properties. At the same time, peanut butter is rich in proteins and manageable in calories unless of course you eat an entire jar every day. Combined, the snack is healthy, tasty and makes you feel full without any negative side effects. Yogurt with Berries – Take a cupful of low fat yogurt option and pile it up with your favorite berries. Blue berry, black berry, raspberry, cranberry or even strawberry for that matter on yogurt can be the most delicious and healthful snack you can indulge in before bedtime. While yogurt works wonders for your gut and overall health with its probiotic content, berries work their miracles by offering essential nutrients and antioxidants to the body. String Cheese – This option of light cheese can be your lifesaver when it comes to snacking at bedtime. Full of protein and complete with fat, it will only take a little of it to help you feel full. A serving can get you to anything about 80 calories which is a risk worth taking if you have controlled your diet since morning. 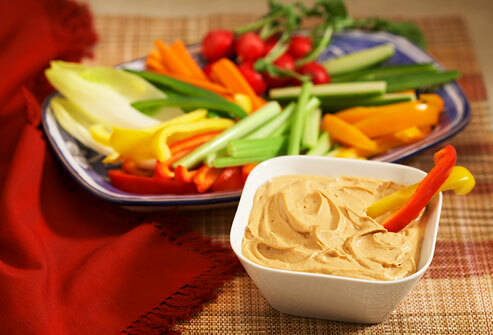 Fresh Veggies with Dip – It is always wise to chop a bowlful of fresh veggies including baby carrots, radish, beet etc in the fridge and pull it out every time you feel snacky at night. Fresh colored vegetables are just as good as they look. They are light and rich in nutrients that replenish your body every time you munch on them. At the same time, they are rich in fiber which can prepare your gut for excesses to follow the next day. Lean Meat Sandwich – While this sounds like a hefty treat, it is actually not so. You can replace the white bread with whole gain one and use only one piece of bread than 2. Add a couple of piece of lean meat tossed in your preferred spices and get going. The snack is full and healthful too which will leave you amply satiated while not tampering with your health.